The world ended some time ago. Our days are dust and sand. We build what we need to survive from the remnants of the old world . . .
Remnants takes place in a post-apocalyptic world. Each player builds a compound and fights to survive Raiders and mutant creatures. Send Survivors into the Badlands to roll dice in a real-time race for Resources, and then take turns spending those Resources to buy weapon, defense, and special development cards. When threats attack, roll dice and use abilities from cards you purchased to stay alive and fend off the assault. Designed by Matthew O’Malley, Ben Rosset, and our own Justin De Witt. 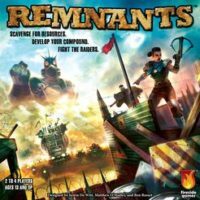 Add a Review for "Remnants"